Capping the moment of Mike Pence's introduction as the GOP's vice presidential candidate was an air kiss of epic proportions. Donald Trump is clearly smitten with his choice to be his right hand man; it's just too bad that Pence doesn't feel the same way. Their awkward interaction was, of course, captured immediately and beamed around the world for you to ridicule. 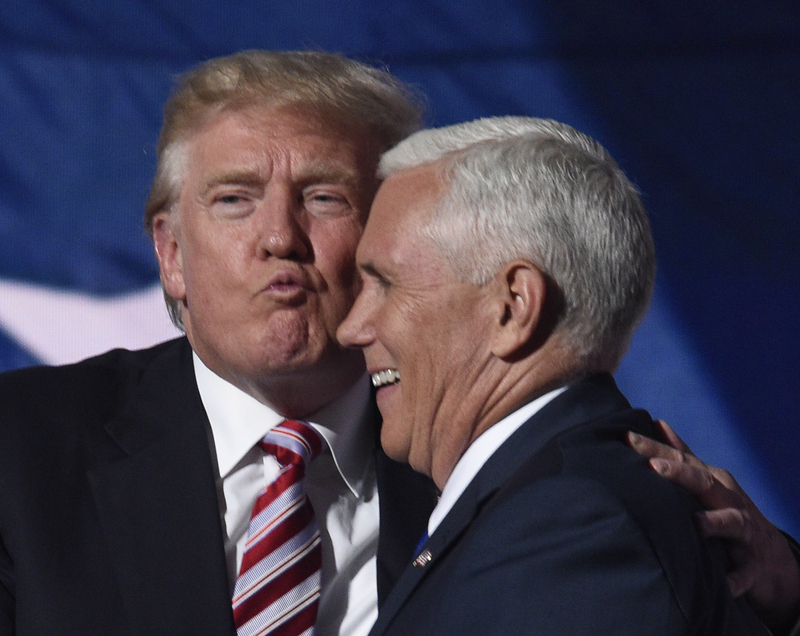 These tweets and memes of the Trump-Pence air kiss gone awry capture the hilarity of the situation to a tee. Sure, Spence is all about Trump. Pence's speech — in addition to telling his own story — declared Trump "the genuine article." Pence told the arena full of convention goers about Trump. "He is a doer in a game usually reserved for talkers," he said. "When Donald Trump does his talking, he doesn't tiptoe around the thousand new rules of political correctness. He is his own man. Distinctly American." That sounds positive... just not enough to pecker up. And, ya, Pence didn't really know how to speak well of Trump, given his lack of political accomplishments, other than winning the GOP nomination, of course. He even acknowledged that other politicians haven't enjoyed being around him. Instead he talked about Trump's family. "If you still doubt what I'm saying, as we say back home, you can't fake good kids. How about his amazing children? Aren't they something? These are the true measures of our nominee." One small note: if we're voting based on kids, Chelsea wins this for the Clintons hands down. In any case, despite Trump being "distinctly American" and his kids being "good," Pence is just not feeling the full-on Bromance. And that brings us to the Twitterverse. The pucker on Trump's face is out of this world and amazing, but the reaction might be even better. For example, if Trump loses, it could help Pence's favorability ratings in the long-run. Most people now know him as an anti-LGBT right-winger. But maybe his discomfort with homosexuality is just a reflection of his discomfort around men like Trump. Or maybe the rejection was just more anti-gay bigotry. Or maybe it was just too much for the first date. What would be even more disturbing is if this weren't the first time. Then there's a theory that undermines the one nice thing that Pence had to say about Trump in his speech, his "good" children. Then there's the possibility Trump rethought things at the last minute. Or he's just not used to being on a stage under political circumstances. In any case, you don't want to miss, what is perhaps the best moment of the convention so far. Put that Vine on replay and bask in the glow of the awkwardness.